Talk with children about how people express patriotism in many different ways. Why do you love the United States? How is it different from other countries? What makes it a great place to live? What could we do to improve it? See how many flags you can find flying in your local community. Discuss that the fifty stars represent our fifty states and the thirteen stripes represent the original thirteen colonies. A star was added to the flag on the 4th of July after the admission of each new state to the Union. Show children how to fold a flag. Volunteer at a local veterans hospital. Talk to patients about their lives and experiences and include children in the conversation. Read the Declaration of Independence to children. Have them pretend they are starting their own country and try writing their own Declaration of Independence. Read through the Bill of Rights and discuss why our founding fathers thought these rights were important. Develop a Bill of Rights for your home. Write a soldier a thank you note or a letter. Watch documentaries on American history together. Help a deployed soldier’s family. Contact a local base, National Guard, or Reservist location and ask what you can do. Vote whenever there is the opportunity. Bring your children with you and share with them how fortunate we are to have this right. Talk about your own family history. Research which ancestors were veterans or were involved in the armed forces. Design a family tree or timeline to trace your family’s history and immigration to the United States. Discuss why your ancestors immigrated to America. Go to a 4th of July or other patriotic parade. Participate in the event if possible. Sing patriotic songs together. Write down the lyrics and discuss what they mean. Talk about the sacrifices civilians made during past war times, such as rationing gas. Share how many women worked for the first time during World War II. Eat MREs (Meal Ready to Eat) for dinner one evening. (MREs can be purchased at camping stores.) Discuss the sacrifices our troops make when deployed. Acknowledge the reason behind a national holiday. What is its history? How did it come about? When you see a member of the armed forces or a public officer say thank you. 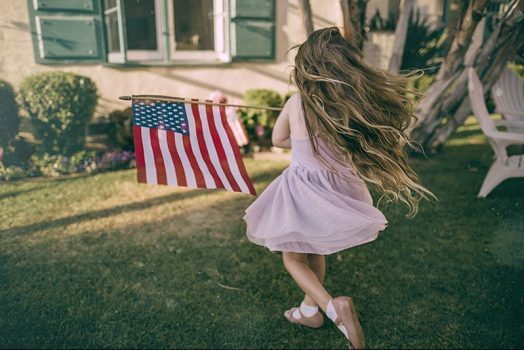 Ask children to think about ways they can express their love and devotion to our country. These simple activities are fun and interesting ways to share patriotism with children and teach them the history of our nation. Rachel Robertson is the author of Deployment Journal for Kids, a special place for military kids to record their feelings and events when a loved one is deployed. In this wonderful award-winning picture book, Amanda writes her hopes and wishes on yellow ribbons and ties them to her wishing tree during her dad’s deployment. Military life is a colorful adventure, filled with challenges, blessings, and a whole lot of red, white, and blue. Frequent moves, deployments, and close friendships over the miles are just a few common shades. Elva Resa’s Coloring My Military Life books let you choose your palette to express your own military life experience. In Cedric and the Dragon, by Elizabeth Raum, Prince Cedric is slow to walk, has a tough time with reading and math, and fails miserably at dragon slaying school. But with kindness and bravery, and his love for hugs, Cedric saves the kingdom.